Most livestock producers understand the desirability of having forage legumes such as clovers and vetches present in pastures. As compared to grasses and non-leguminous forbs, biological nitrogen fixation and improved forage quality provided by legumes are major attributes. In addition, in some cases legumes can extend the growing season and increase forage yield. These are powerful incentives for using legumes because they can have a significant impact on animal performance and profitability. Any of several soil-related factors can affect the presence and/or persistence of legumes in pastures. Most legumes require a soil pH of 6.0 or higher in order to make optimum growth. In addition, they generally require higher levels of phosphorus and potassium than grasses (of course, a soil test report will provide recommendations for any lime, phosphorus and potassium needed). If seed production by legumes is desired, it will be likely that application of two to three pounds of boron per acre will be recommended. Other factors can also limit legume stands. Anyone who plants legume seed needs to pay attention to date of planting, seeding depth, amount of seed to be planted per acre, and planting technique. Also, legume seed should normally be inoculated with the proper type of bacteria before planting. In some locations where legumes are planted into a sod, it may be prudent to apply an insecticide to control crickets at planting time. Furthermore, grazing management that prevents excessive grass competition can be important for the purposes of preventing shading of legume plants or to favor reseeding. All of these points are valid and should receive consideration by anyone who seriously wants to have legumes in his or her pastures. Amazingly, one factor that severely limits legume presence in many pastures is rarely mentioned. Before I reveal this factor, I want to call your attention to an interesting phenomenon. 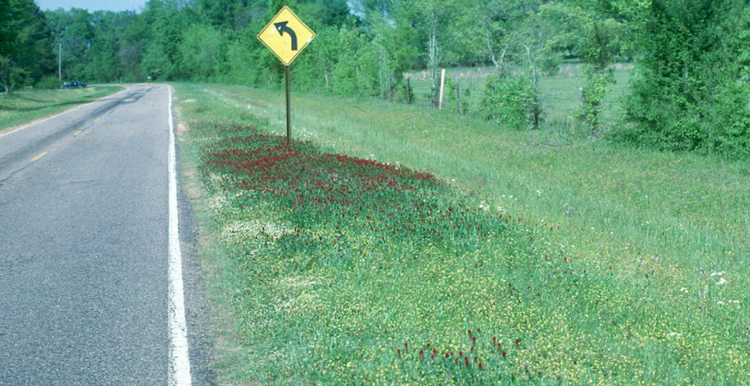 In spring when many legumes are blooming, volunteer stands are easily visible along roadsides in many parts of the Southeast. These may include crimson clover, hop clover, ball clover, arrowleaf clover, red clover, white clover, black medic, and vetch. Incredibly, the legumes often can be seen growing right up to a pasture fence, but not inside the pasture! What makes the difference between a roadside where legumes volunteer readily and an adjacent pasture where they are not present? At first it doesn’t seem to make any sense. After all, roadside rights-of-way are not limed or fertilized, there is no cricket control, no precise legume seed planting techniques are used, nor is any grazing management exercised. What is going on here? It is dangerous to make broad, sweeping generalizations, because there are exceptions to most rules. However, in many cases, the main reason we often see more clover and other legumes along roadsides is simply that grazing animals limit legume seed production in pastures because they selectively graze these high quality, palatable plants. Along the roadside where grazing animals (other than wildlife such as deer) cannot graze legumes, the plants have the opportunity to make seed, year after year. Thus, because the soil (seed bank) along many roadsides eventually contains seed of many legumes, an impressive volunteer stand of these highly beneficial plants is often presen year after year. Here is a profound and truthful statement. While many different factors including those discussed earlier can have a negative effect on legume stands in pastures, a lack of legume seed in pastures is also often a major limitation. However, this doesn’t have to be a limiting factor, because lots of farm stores sell seed of clovers and other legumes. The presence of legume seed in a pasture does not ensure there will be a legume stand, but having no legume seed in a pasture ensures there will not be a legume stand. Foraging Ahead is a column presented by Ragan & Massey and written by Dr. Don Ball, Professor Emeritus at Auburn University. Dr. Ball is one of the authors of the popular book “Southern Forages,” available here.